Turkish High Quality Global Clothing Factory has come to Owerri, the capital of Imo State to create a difference in the clothing and fashion industry. ELIZABETH JOHN, the manager tells business a.m’s DIKACHI FRANKLIN why Owerri, the Imo State capital has been chosen as the African headquarters and the impact they have created among the youths in less than four months in Nigeria. What’s High Quality Global Clothing Factory all about and what’s your role in the business? 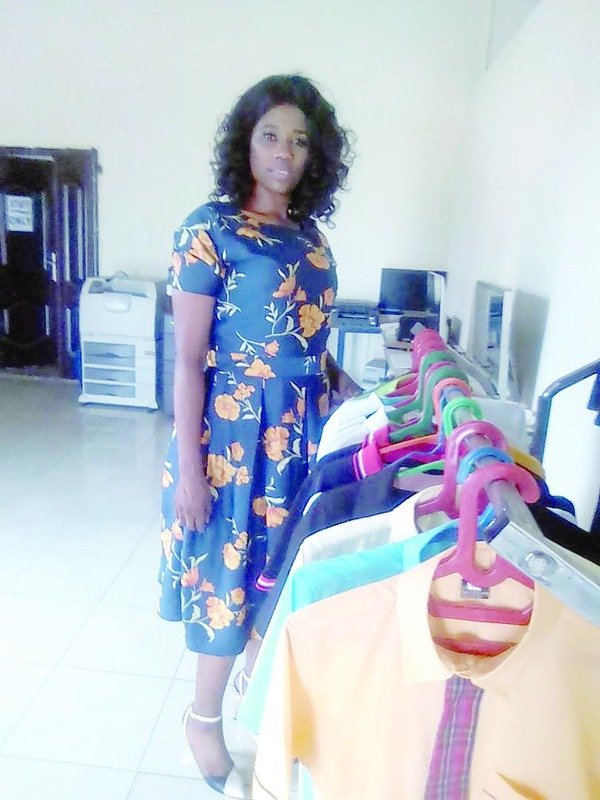 First of all my name is Elizabeth John, I am the manager of the High Quality Global Clothing Factory here in Owerri , we produce school uniform of every kind and T-shirts and some of the works you can see here, shirts, senators, jeans, I mean, clothing in general. Has the economy been very favourable on your business or is it tough as some entrepreneurs of your type in the same line of business with you say? Actually that is the problem of Nigeria today because of the environment for doing business. What you need for business to thrive is not in place, therefore you have to, somehow, do something and also raise it up to the standard you want. Yes the economy is not favourable on business for now but what can we do? We still strive to make sure that business goes on and you cannot say that the government or the economy is tough and close shop. Almost all the businesses have some challenges they face in Nigeria now, can you tell us if yours is different as a manufacturer of clothing in the Owerri-Onitsha Road Industrial Layout here in Irete, Owerri West local government area? There are so many of them but the chief among them is lack of electric power. So we have to keep our business going by using our generators and that is very, very expensive. When you are in business and there are certain things the government should make available for you but when those things are not available, you have to pay heavily to get an alternative to ensure they are available and it is not fair. There is no power especially in this industrial layout. We have been here for the past four months now, working with epileptic power supply, I can tell you how much we have spent on buying diesel, and it’s really on the high side. But you still pay for the EEDC bills even though they do not supply power, and you do not see their electric power to work with, it is very challenging. Can we know how much you spend on purchasing diesel monthly to ensure that you have power to run your business? It is really much, running into hundreds of thousands of naira monthly. We have the big and small generators, which we run for hours to provide power, it is not encouraging for business especially like ours, spending so much on diesel and still pay EEDC bills. I can see a lot of people on jeans trousers with red T-shirts, are they staff and can we know how many staff you have here? We have up to 50 staff and the good thing is that we train them for free, some of them came here without having a back ground of sowing clothes but my director did it as a kind of giving back to the society, that is his own corporate social responsibility (CSR). Instead of asking these young people to pay they are being trained free of charge. Many of them have just graduated and instead of staying at home we called them to come and learn something without asking them to bring any money. So many of them came, we trained them free starting from the time we started operation in Owerri and we also give them transport allowance to encourage them. We do that to encourage young people because the motto of our company is “changing lives, making a difference.” So we want to make a difference in the clothing and fashion industry here in Nigeria. In this case what do we do? We say, come we don’t need your money and let us train you and at the end we employ you and place you on salary so that you work for us to help and reduce crimes and criminalities on the streets of this country, Nigeria. Does the present government of Imo state, led by Rochas Okorocha, know about this good gesture done to the youths who could have taken to different kinds of criminal acts? No, I can tell you that the state government may not be aware of it. It is just like the company giving back to the society, so we do not need to announce our good gesture and kindness to the people. It is part of the company’s contributions to the nation building. Nigerians are madly in love with foreign materials and imported clothing, how much patronage do you receive, do you work at full capacity to meet orders placed by your clients since there is epileptic power supply from EEDC? Fine we work at full capacity; we produce also to meet orders placed by our customers using our generating sets. The challenge we have in this country is that we prefer things from outside the country to the ones made in our country. We came into this country to bridge the gap. The things you get outside Nigeria you can also get them here in this company with good quality because we use Turkish standard and produce Turkish quality in our factory here in Nigeria, our products are Turkish products, our materials are Turkish materials, you can see by yourself that our products are of international standard. So that is why we say we are making a difference and changing lives. You do not need to go abroad to import your wears anymore, you can get them here, good jeans, good T-shirts, good shirts, good uniforms etc, you can get them in High Quality Global Clothing. Who are your clients and who do they come from? We are producing for everybody, companies, corporate bodies, those who can also sell, because we want to make sure that everybody has our products, we have patronage from companies and individuals and our clients are all over the country. There are many firms doing the same business you do and are also in competition with you how are you dealing with competition to make sure that you keep the business afloat? That is our quality, we are called High Quality Global Clothing, the quality makes the difference, what differentiates us from other competitors is the quality we produce. And our quality is of international standard, if you want we can walk around and I will show you so that you can feel the texture of the materials we use. How do you procure your materials, from the textile companies in Nigeria or abroad? Right now the materials we are using for productions came from our head office in Turkey. This company is a joint venture of Turkish and Nigerian partners and our African headquarter is in Owerri, Imo state. Why did you locate the African headquarters in Owerri instead of Lagos or Port Harcourt? Every business must not be in Lagos or Port Harcourt, Owerri is a beautiful city and has so much to offer and if you look around, there are no many of this type of industry in this industrial layout in Owerri and we felt that people here need our good products. And the environment here favours us apart from the power problem. And my message to the general public is that High Quality Global factory is here to meet their needs; there is no need to go to China. China is not the ultimate, we are capable of serving them, we have the capacity, we have the man power, our products speak for us, we are here to make a difference.